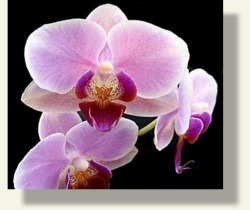 The delicate beauty of the orchid is captured in our evening of elegance. This final evening event is intended to celebrate new friendships by providing a setting and aura of elegance. Upon arrival, ladies are presented with white orchid corsages and gentlemen receive white orchid boutonnieres. Guests sip champagne and enjoy the lyrical sounds of the harp, while white gloved waiters circulate passing trays of pate, caviar and other gourmet delicacies. The excitement of the evening begins to heighten as guests step through a flower covered archway and let the soft lights and fragrant blossoms take them to a place of romance and elegance. The dining room is entrancing and gracefully decorated, captivating in its sensitivity and floral beauty. Hundreds of tiny twinkling lights glisten like fireflies among the trees, foliage and surrounding white latticework. Tables dressed in white linen are highlighted with sprays of dendrobium orchids and flickering candle light, creating a subtly elegant mood. A small orchestra serenades guests while a gourmet meal that will tease the appetite and treat the palate is served. Later in the evening, a vocalist joins our musicians and woos guests onto the dance floor with mellow, contemporary sounds. Soft lights, fragrant blossoms and lilting music combine to form our Orchid Fantasy.